You will notice that basic stats are produced, such as the solver and preconditioner used. The Flag field helps to interpret the mathematical status of the solve process. The example here shows a successful convergence in 27 iterations, but the Flag can also indicate conditions such as solver stagnation (failing to make progress for several consecutive iterations) or numerical breakdown. The Residual field indicates the quality of the final answer. There is then a timing output block, which shows a total execution time plus a breakdown of where the time was spent. The Overhead field shows time spent for GPU-specific operations such as device memory allocation and transfer. The Precond field shows the total time required to generate the preconditioner, because the time required to generate a given preconditioner can vary wildly among different matrices and different preconditioners. The final field, Solve, shows the time taken for the actual system solution. In addition to the culaIterativeResult field, each solver returns a culaStatus that is used to indicate important runtime information, such as incorrect parameters (specifying a matrix size less than zero, for example) or not having the proper version of the CUDA driver installed. Users of CULA Dense will already be familiar with this parameter. In all cases, it is recommended to first check the returned status, followed then by obtaining the iterative result string. The examples in your CULA Sparse installation clearly show how to integrate this into your code. Selecting the "best" sparse iterative solver and preconditioner is often a difficult decision. Very rarely can one simply know which combination will converge quickest to find a solution within the given constraints. Often the best answer requires knowledge pertaining to the structure of the matrix and the properties it exhibits. To help aid in the selection of a solver and preconditioner, we have constructed some flow charts to help gauge which solver and preconditioner might work best. Again, since there is no correct answer for a given system, we encourage users to experiment with different solvers, preconditioners, and options. These charts are only designed to give suggestions, and not absolute answers. 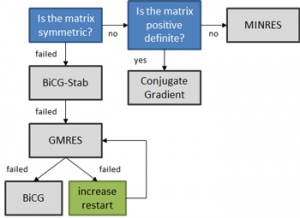 Selecting an appropriate solver in CULA Sparse. Selecting a high performance preconditioner in CULA Sparse. 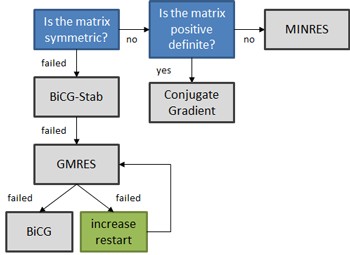 In this post, I’ll show you how to call a matrix solve using our soon to be released CULA Sparse package. For this example, I will show the main tasks to calling our Cg solver with a Block Jacobi preconditioner for a CSR matrix with double-precision data. As you can see, setting up problem options is an easy task. Each option is clear and self-documenting. The config initialization routine will set sensible defaults for most problems, but it’s worth double checking to see if they meet up with your own needs and perhaps overriding them as we have done above. 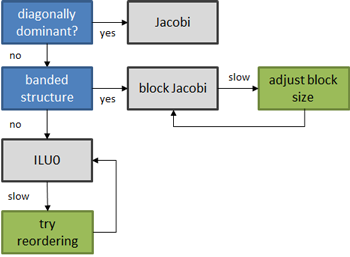 Above, we have default initialized both structures but then overrided the Block Jacobi preconditioner block size. Because each solver and preconditioner is initialized very similarly, this makes trying out different solvers and preconditioners an easy task. That’s it! We built CULA Sparse so that it would be easy to set up and work with different options while making sure that the code is always clear about what it is doing.